The votes are in and Wu Den-yi has been elected the next KMT party chair, so I guess it is just about time for me to write up my election preview. That is roughly twice as many votes (and KMT party members) than the last KMT party chair election. However, before you get too excited about a certain member mobilizing new members, remember that this is actually quite a bit fewer votes (and party members than the 2005 party chair election when over a million people were eligible to vote and over half a million votes were cast. I was out of the country when the accusations of vote buying exploded, so I mostly missed that. However, I did watch both debates on Youtube, and I learned quite a bit from those forums about how each candidate was presenting him or herself. I’ll discuss the candidates in reverse order of their finish. Pan was elected to the legislature in 1992 and has spent most of the last 25 years in the legislature, often also serving on the KMT central committee. For someone who has been at the center of national politics for so long, I was somewhat surprised by how little I knew about her. She is a second generation politician, and she comes out of the Huang Fu-hsing (military) system. However, I can’t remember hearing her speak very many times, and I never thought of her as particularly extreme. As such, I was a bit taken aback when she came out in the first debate breathing fire, demanding state reparations for the current wave of Green Terror against the KMT. She seemed determined to displace Hung Hsiu-chu as the candidate of the reactionary nostaligists. She toned down the rhetoric a bit in the second debate, but she managed to redefine herself in my eyes. I don’t know what Pan was doing in the race. She never seemed to matter, and she never carved out a distinct niche for herself. Chan was a complete mystery to me when this contest started. He had served as Economics Minister, but I don’t pay a whole lot of attention to governing. I’m into politics. I had heard his name bandied about as a possible running mate for the KMT presidential candidate, but that came to nothing. In retrospect, the high moment for Chan’s party chair campaign might have been when they announced the final results of the signature drives. All six candidates easily passed the minimum threshold, but Chan somewhat surprisingly finished second, edging out Hung and Hao. This turned out not to be predictive of the voting results though, as Chan actually got fewer votes than signatures. In the second debate, Chan mentioned that his mother had been a Changhua county councilor and his brother had been Yuanlin town mayor. This was news to me, and I’m supposed to know these sorts of things. However, there was a reason I had never heard of them: they were elected back in the dark ages. Chan’s older brother was elected mayor in 1973, and we don’t have systematic records from town elections that far back. In fact, Chan comes from an elite local family with several prominent doctors. A bit of googling revealed that he is distantly related in some way to most Taichung and Changhua local faction families and even a few opposition politicians. However, the family’s electoral activities were decades ago and the old nework is almost certainly long gone today. In the debates, Chan was the embodiment of a bureaucrat. He exuded as little charisma as possible and gave me the impression that he understood all of the details of problems without necessarily grasping the big picture. He spoke of visiting grassroots party members as if they were some abstract idea. People who routinely interact with ordinary voters don’t talk about those interactions as if they require some special effort. Someone told me that Steve Chan is close to Lien Chan. I don’t know if that is true, but they have very similar styles. Hau Lung-pin had exactly one remarkable idea. He stressed repeatedly that if he were elected chair, he would not personally run for president in 2020. Instead, he would ask Hon Hai boss Terry Gou to be the KMT candidate. Let’s think about this for a minute. There are a few reasons that this might be a good idea. 1) The KMT doesn’t exactly have a stable of qualified, charismatic candidates foaming to challenge President Tsai in 2020. Everyone is flawed, and no one is terribly popular. 2) The conventional approach failed dramatically in 2016, so the KMT needs to try something new. 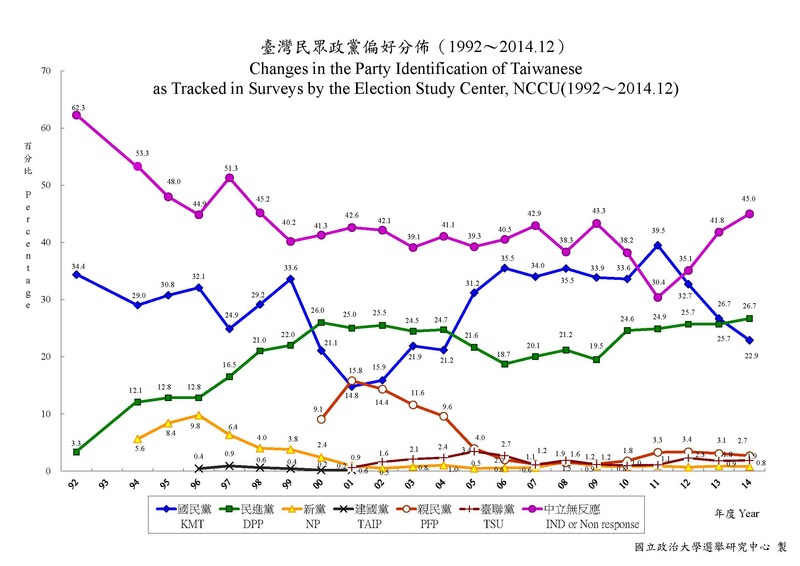 3) Public opinion surveys show that Gou is more popular than any current KMT politician. 4) Donald Trump just showed that the USA was willing to vote for a business tycoon with no political experience, so maybe Taiwanese voters will follow suit. There is the small matter that Gou is currently busy running Hon Hai and may not have the time or desire to run for or serve as president. Nonetheless, Gou didn’t shoot the idea down, and there have been a few discreet trial balloons hinting that he might be willing. Rich people think they can do anything, that their immense wealth proves their superior wisdom and vision. Gou’s availability may not be the fundamental flaw in Hau’s plan. There are two basic problems with Hau’s plan. The first is that Gou would probably bomb miserably as a presidential candidate. Gou has reasonably good poll numbers now, but the public hasn’t thought carefully about Gou as a potential president. He is a very successful business leader – with a far more impressive record than Donald Trump – and the public evaluates him mostly as a business leader. Once he becomes a politician, the media scrutiny will intensify and become much more critical. The halo surrounding Eric Chu in 2014 melted away in only a few months under the harsh spotlight of national politics in 2015. 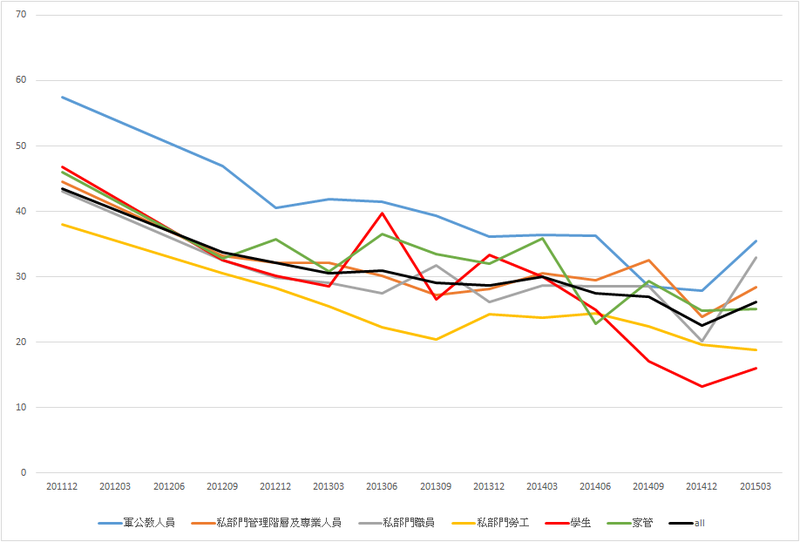 Gou’s current good (not great) polling numbers are almost irrelevant; six months after entering the political fray the public will think of him in a completely different light. I don’t care what the current polls say. I can’t see any way that Terry Gou wouldn’t be a disaster as a presidential candidate. Hau Lung-pin bet his political career on a terrible idea. The second problem with Hau’s plan to ask Gou to be the presidential candidate is that it shows that Hau fundamentally misunderstands the nature of power in Taiwanese politics. Quite simply, power flows from the presidency. This is not unique to Taiwan. When there is an elected president with significant power, parties organize themselves to capture that big prize. Parties are presidentialized. Regardless of who holds the formal position of party leader, the de facto leader of the party is the incumbent president, the presidential candidate, or the person who could potentially become the presidential candidate. By promising not to run for the KMT’s presidential nomination in 2020, Hau basically ensured that he would never wield any power. His campaign appeal boiled down to, “Elect me as your leader so that I can refuse to be your leader.” Not only is this an illogical appeal, we’ve just seen how badly it works in practice. Eric Chu tried being a neutral referee in early 2015 when the entire party was practically begging him to run for president. That didn’t work out well for either Chu or the KMT. To recap, Hau made a terrible choice in choosing to outsource the KMT presidential nomination, and he made another terrible choice by selecting Gou as his target. He deserved his humiliating third place finish with a pathetic 16% of the vote. I don’t have a lot to say about Hung that hasn’t been said many times over the past two years. She is far too extreme for the Taiwanese electorate. She was a disaster as a presidential candidate and party chair, and if it had elected her to another four years as party leader the KMT would have been sentencing itself to political oblivion. This wasn’t working, and even most of the KMT members who like what Hung stands for could see that the party needs to go in a different direction if it ever wants to return to power. It wasn’t a surprise that Wu won the race. He acted like the front-runner and the other candidates and the media treated him like the front-runner throughout the campaign. His first-round victory was perhaps a surprise, though. I had thought that he would get somewhere around 45% and need a second round to dispatch Hung or Hau. Instead, he won 52% and beat the second place candidate by 33%. In a race with five candidates getting significant numbers of votes, 52% is a fairly impressive result. Wu’s strategy can be summed up quite simply: Let’s party like it’s 2011! In this view, there was nothing wrong with the party that won the 2008 election and was re-elected in 2012. Everything was going well until the party got derailed during Ma’s second term. The KMT flubbed things like the gas and electricity pricing and the capital gains tax. They failed miserably at political communication, and the population came to believe that nuclear power was dangerous and that the Services Trade Agreement would somehow risk Taiwan’s political sovereignty while transferring enormous wealth to the rich elite. The KMT failed most disastrously by shifting away from the 1992 Consensus under Hung Hsiu-chu. The task at hand is simply to return to that winning strategy. That means the entire package. For example, the KMT has to rebuild its ties with the local factions, assuring them that they are still a critical component of the KMT coalition. It also means returning to the greater ambiguity of the 2008 campaign, in which Ma repeatedly promised “no unification, no independence, no war.” In subsequent years, the KMT seemed to forget the “no unification” part of that formula. However, this does not mean that Wu Den-yi is a modern-day version of Lee Teng-hui, secretly scheming to lead the KMT and Taiwan toward independence. Wu is a deeply conservative person who believes in traditional values and deference to authority. He is well-schooled in the Church of Sun Yat-sen, and there is very little evidence he is not a sincere and committed believer. Lin Yang-kang and Wu Po-hsiung are much better models for Wu than Lee Teng-hui. Wu firmly supports returning to the 1992 Consensus, including the part about insisting that there is only One China. The Ma presidency was built on the premise that Taiwan’s economy should be further integrated into the larger Chinese economy for both economic and political purposes. Economically, Ma believed that integration would lead to faster economic growth for Taiwan. Politically, Ma saw an economic appeal as a way to win votes from a public skeptical of the glorious history of the Republic of China. The message was, “Don’t worry so much about China. We won’t take any steps toward unification. Instead, we will use them to make ourselves rich.” Of course, this strategy depended on negotiating a better economic relationship, and China would not negotiate with Taiwan unless Taiwan accepted the One China principle. The ambiguity that Ma was so proud of involved telling China, “Look, One China! Don’t worry about independence!” while simultaneously telling Taiwanese, “Look, each side with its own interpretation! Don’t worry about unification!” This delicate balancing act arguably produced two election victories before, in Wu’s interpretation, the KMT blundered by walking away from it. Wu promises to resume the friendly (but still arm’s length) relationship with China by reaffirming and adhering to the One China principle. Is Wu correct to think he can simply put the old band back together? I have some doubts. For one thing, China in 2017 (and 2020) is not the China of 2005 or even 2012. Today’s China is much less deferential to the international order and much more aggressive about pursuing its international interests. In 2005 the world was still talking about the peaceful rise of China, and it was marginally plausible that Taiwan could have an exclusively economic relationship with China (win-win!). These days, China looks far more predatory and menacing. Further, in 2005 the two economies were more complementary, matching Taiwanese capital and technology with Chinese labor. Today, the two compete directly in many critical sectors. 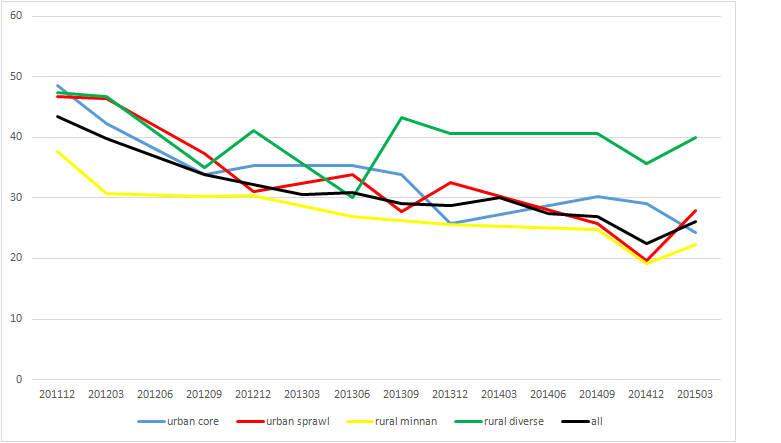 Finally, the Chinese economy is no longer growing at miraculous rates; it is now entering phase of relatively slower growth. 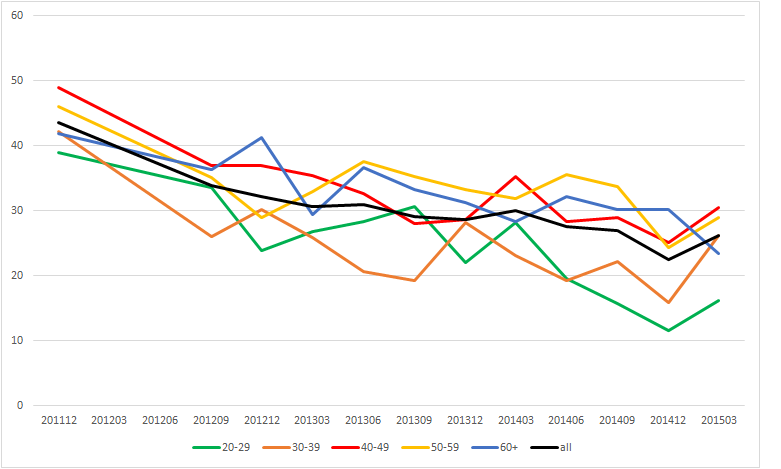 A second and more important point is that Taiwan of 2017 (and 2020) is no longer the Taiwan of 2005 and 2012. Identity has shifted. I assume that my readers are all familiar with the NCCU Election Study Center trends on national identity. Prior to 2008, more people held a Chinese identity (either exclusive or dual) than an exclusive Taiwanese identity. After 2008, that has no longer been the case. Nowadays, exclusive Taiwanese identity outpaces Chinese identity by a large margin (58.2% to 37.7% in the most recent data point). 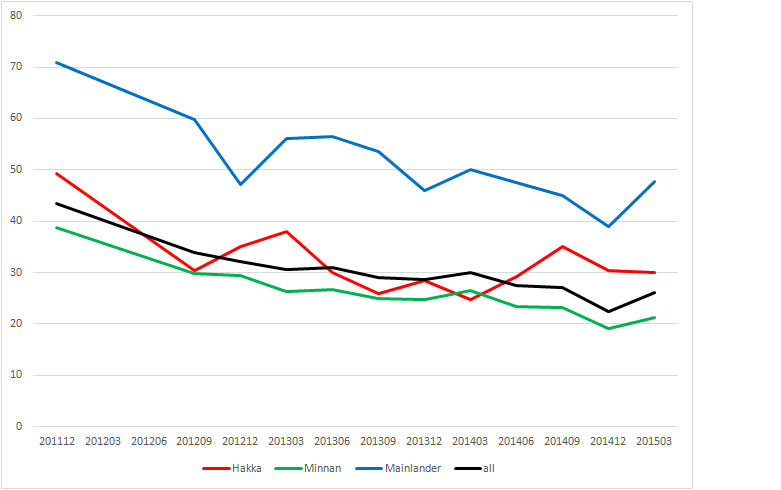 This is partly due to generational replacement, partly because some people have changed their minds, and partly because the language of political discourse has changed and Taiwanese are simply less likely to use the term “Chinese” to refer to themselves regardless of their political stance. Nonetheless, a KMT promising One China will face a far more skeptical electorate in 2020 than in 2008. The third problem for this strategy is that the 1992 Consensus is no longer the same thing. In 2008, no one knew how the 1992 Consensus would work in practice. If you wanted to project optimistic or pessimistic visions on it, you could. Now we have eight years of experience. By the last few years, China was increasingly unhappy with Taiwan’s reluctance to take more concrete steps toward unification, and the Taiwanese electorate was increasingly unhappy with the continual degrading prostrations and erosion of sovereignty necessary to keep the official channels open. Ma’s implicit promise to voters, “Don’t worry about the political implications; this is just going to be pure economics,” was increasingly far-fetched. Instead of the wink-wink-nudge-nudge promise that the 1992 Consensus would allow Taiwan to enjoy both political sovereignty and close economic relations, it became increasingly apparent that the two were, in fact, inseparable. Accepting One China would have political consequences. In Taiwanese politics, whenever one issue (in this case economic strategy) clashes with the China cleavage, the China cleavage subsumes and absorbs the other one. I don’t think Wu can simply ignore eight years of history and pull them back apart. My guess is that Wu will be fairly successful at holding the broader KMT coalition together. I don’t expect a spate of new splinter parties from the blue side, at least not in the next year and a half. However, I think Wu is overestimating the number of voters who are waiting to be pulled back into the KMT coalition. In 2012, 54% voted for Ma or Soong. In 2016, only 44% voted for Chu or Soong. Wu might consolidate that vote, but his plan to return to the good old days of 2011 doesn’t seem to me to hold much promise of expanding it much. Wu Den-yi is betting otherwise. I guess we’ll see. 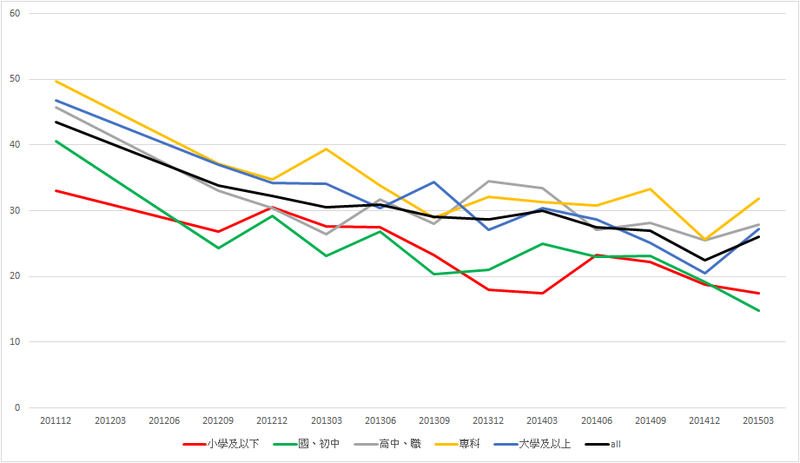 If you want to understand why the 2016 election won’t look anything like the the 2012 election (or any other election in the past two decades) but you only have time to look at one indicator, you should look at trends in KMT party identification. It’s easy to get lost in the little details (and I indulge in little digressions all the time), but I always try to remind myself to keep one eye firmly on the big picture. Read more in my piece for the China Policy Institute blog. Much has been written about the various party lists, especially the KMT list. I don’t want to repeat all of that. Yes, I agree that no one seems to know why the KMT nominated Jason Hsu 許毓仁 and that several important constituencies in the KMT are really pissed off right now. However, I want to look at the lists from a different angle. From the mid-1990s through the mid-2000s, the KMT and DPP had very different ways of producing their party lists. The DPP generally had some sort of contested party primary, with party members voting on nominations. What this meant in practice was that each faction would determine how many people it could support in the safe section of the list and then organize its voters to vote for them. The factions registered large numbers of members for these (and other) contests, and there were often abuses. Factions were wary of allowing their members to be poached, so they kept a tight leash on members’ information. Dozens or even hundreds of members were registered at a single address, which usually turned out to be some faction organizer’s home. The faction bosses sometimes also paid their party dues, so that when it came time to vote, they could count on strict discipline. In nomination contests, faction leaders made deals across different districts. You vote for my candidate in county A, and I’ll vote for your candidate in county B plus give you 150 party list votes. Sometimes loyalty was enough to arrange these complicated deals, but sometimes they were cemented with a cash payment to the voter. Yep, that’s vote buying. It was a clear test of strength, and the factions tended to dominate the resultant party lists. Even when the DPP had three different sections for politicians, women, and experts or disadvantaged groups, the latter two groups were thinly veiled factional contests. Because the primaries took place at the same time as the district primaries, these fights tended to happen in the late spring or early summer of election years, months before the general election. The KMT did things very differently. It tended to delegate the decision to the party leader, who usually had a committee put together a list. Of course, the leader had the final say if he wanted to exercise that right. However, the party leader didn’t have a free hand to stack the list as he wished. The list was a carefully negotiated bargain between all the different factions of the party, and the committee/leader was simply the final arbiter of the struggles. The KMT always released its list very late in the election campaign, just before the official registration period started. This forced aspirants to work hard for the party during the early and middle stages of the campaign in order to maximize their chances of getting on the list. It also prevented backlashes. If a politician found that she had been left off the list, it was typically too late to launch an independent candidacy in the district. Remember, she wouldn’t have laid any of the groundwork for a district campaign since that would have signaled the party leaders that she was disloyal and didn’t deserve a spot on the list. Moreover, since the list was only released when the final campaign was under way, it was too late to try to launch a rebellion within the party. Supporters were already focused on the party-to-party fight for the general election and would not want to expose divisions within the party. Losers simply had to accept being left off the list. In 2012, the DPP revised its rules and moved toward the KMT system of delegating construction of the list to the party leader (who then delegated the task to a committee). There were two reasons for this change. First, the Election and Recall Law had recently been amended to extend penalties for vote-buying to cover primary elections as well as general elections. The DPP feared that the KMT would use this new provision to accuse it of vote buying in the primaries. Without reform, there was a real possibility that the DPP could go into an election with half of its list facing indictments for vote buying. That would have been both a public relations nightmare and also a governing disaster, since any conviction would strip the legislator’s seat. Second, the DPP had just gone through a vicious round of factional infighting in 2007 and 2008. By 2010 and 2011, that traumatic experience was still fresh in party members’ minds, and they did not want to go through another naked struggle for power. Delegating the task to the party leader seemed to be a better solution, especially since party chair Tsai Ing-wen did not have her own faction. It didn’t work out very well for the DPP. The list was a balance of the various factions, and it didn’t go over very well with the general public. During the summer and early fall, there were continuous calls for the DPP to revise its list. Tsai adopted a tough line, refusing to admit there was anything wrong with the list and resisting any efforts to reopen the decision. However, the new system did not produce a list that helped the DPP win votes. This negative image was exacerbated by the glowing reviews the KMT got for its list. Chairman Ma declared he wouldn’t just hand out spoils to the various KMT factions, and he put a few activists in high positions on the list. The media was particularly smitten with the #2 legislator, disabled activist Yang Yu-hsin 楊玉欣. There was a clear contrast in images, with the KMT looking far more progressive. Military generals are always refighting the previous war, and the KMT and DPP both tried to learn from the experience of 2012 when they put together their lists this year. In 2012, the DPP produced its list much too early. Because there was so much time before the election, the losers felt they had the space to try to reverse the outcomes. This time, Tsai copied the KMT’s traditional strategy and waited until the last possible moment to announce the party list. This worked very well. We haven’t heard much at all about the losers. This late in the campaign, they really don’t have much alternative other than to accept their disappointment and hope that there will be other opportunities to move up the career ladder in the future DPP administration. The KMT tried to copy its successful 2012 experience. Then it was Yang Yu-hsin. This time Eric Chu looked for other social activists, and he put these high up on the list. His star selling point is Lin Li-chan 林麗蟬, an immigrant from Cambodia. By making her the first immigrant to become a legislator, Chu hoped to create an image for the KMT as a progressive, open, and tolerant party. However, it isn’t 2012, and the KMT list isn’t selling so well this year. The KMT is so divided right now that even the late release of the list isn’t stopping a backlash by the losers. The various factions are furious, though they don’t all seem to know who they are furious at. They are working hard to keep all that anger under control during the campaign, but dissatisfaction with the list pushed that rage out into the open. Chu has quite a task to turn down the flame and put the lid back on the pot. It would be a challenge for a talented leader. The other problem is that we can now see what happened with all those social activists from 2012. They haven’t had much success in the legislature. The problem is that simply being a legislator doesn’t mean that you have power. If you don’t have power – meaning support from a large, organized constituency preferably expressed in votes – you won’t have power in the legislator. Taipei city councilor Liang Wen-chieh 梁文傑 has expressed this sentiment best. He writes that experts are used by political parties as decorations, but the most they can do is to provide expert questioning during the legislative process. When it comes to the actual decision-making, they have almost no influence. The idea that a mere expert could be a powerful legislator has always been a myth. In fact, if the governing party really valued their input, it could have made them cabinet ministers. It put them in the legislature precisely to marginalize their views while still appearing to value those views. As for the social activists, Liang is even more scathing. People like Yang Yu-hsin and Wang Yu-min 王育敏 are only able to help shepherd KMT bills in their areas through the legislative process and hold press conferences to act as attack dogs. People like Chen Pi-han 陳碧涵 and Lee Kuei-min 李貴敏 can’t even serve as attack dogs, and they are completely anonymous legislators. Eric Chu has put several of these social activists on his list. The angst over whether Jason Hsu is a loyal KMT member and the praise for placing new resident Lin Li-chan on the list misses the point. Neither one of these has any political power going into the legislator, so they won’t have any once they get into it. When it comes time to make important decisions, they will be elbowed into the corner of the room while the big dogs monopolize the center stage. They are merely decorative flower vases. If the KMT really wants to advance progressive causes, it should find a real politician who holds progressive views. However, I do think Lin’s nomination is significant. She is still fairly young, and she has potential to move up. If she can get into the legislature (and #14 is no sure thing), she could then become a leading candidate for the KMT’s Taipei mayoral nomination. The current crop of KMT Taipei legislators is somewhat drab, and Lin could quickly pass them by. And since the Taipei mayor almost automatically becomes a presidential contender, you can see a path for her to the top job. It’s a very long shot, but if you want to take a bet now on the KMT’s 2028 presidential candidate, she makes more sense than most other names. Of course, this assumes that the KMT still exists in 2028. Also, Lin will have a hard time in that election, since Bi-khim Hsiao 蕭美琴 will be running for re-election. You are currently browsing the archives for the party politics category.